If you’re in the 1-3, then there are plenty of solutions and you can continue with blogging but if you’re in 4th one then it’s difficult to get rid of it. You should keep yourself motivated towards blogging. For every single success, you should pat yourself and by this way you can keep yourself motivated. There is a solution of first three problems. I would suggest you to go through the below 3 posts correspondingly to resolve these three problems and continue with blogging. To get success and to make your blog a brand, it’s very important to write great article. But if there is no body to read those articles, what’s the use of it? Actually you’ll get discouraged after some time and you’ll get quit blogging. There are few common mistakes that many bloggers make and the most common is not promoting your blog effectively. Today I’ll talk about the top 3 most powerful ways to promote your blog effectively. If you’re new to the blogging, you should read this article completely to avoid any mistakes. This is not the time to work on SEO tricks. With the latest updates from Google and other search engines frequently, you need to think about some other ways of traffic. You can’t totally depend on the organic traffic. You can’t totally depend on the backlinks to increase the SERP. It’s time to increase the awareness of your blog. It’s time to increase the popularity of your blog and making your blog a great brand. Here I’m going to talk about the few most effective ways to promote your blog and get decent traffic on your blog. This is one of the most effective ways to increase your blog awareness on the internet and also one of the top traffic sources. Only creating high quality content is not enough. You should take that content to the right category of people. You need to write a content which can solve the other’s problem and then you need to take that solution to the needy group of audience. When interested people will find your content, they will visit your site and if will find it interesting, they might share your articles too. Just think how much awareness you will get from this. By using the power of social media you can directly target your audience and in this way your half of the job is completed. As long as you’re serious about your blog and want to continue this as your business, you can’t ignore the power of social media. In my case as soon as I publish a post on my blog, the very first thing that I do is to share on the social media. But here you should take care of the timing. You should share your blog post in the timing when most of the people are active. Suppose you are added in a couple of groups on facebook. In one group most of the people are from US and UK. So you’ve to share your post in their time and if in other major contributor are from Asian sub-continent, you have to take care of their timings too. By this way you can manage to engage more and more people to your blog post. I’m sure you must have account with top social networking sites like Facebook, Twitter, Google+ etc. These 3 are the major networking sites available today. Just you’ve to use these platforms in effective manner. Share your blog posts on these sites and if you think your post is too good even you can use the social advertisements to promote on large scale. Note: Social advertisement is cheaper than the CPC advertisement programs and you can build many more audience then the CPC. So if you’re ready to spend little money, you should definitely try this source. Make good repo with the blog owner where you’ve done guest posting for future. This will help you to increase the links of your blog. Not all the blogs offers guest blogging but still you can find a lot of blog who do offer including my blog too. So before doing guest blogging, email to the owner of the blog about your topic and little details about it. I’m sure, must of the time you’ll receive positive response. And then if your article is good you can ask for at least a link back to your blog. So by this way you can increase backlinks too. But those time gone when guest posting were done mainly for backlinks. Almost all the major search engine now penalizes those blogs which tries to do these stuffs. So to avoid such circumstances you should mainly focus on creating awareness about your blog and this way you’ll get lots of traffic. If you’re getting links also, try to use nofollow attribute. By this way you will never get caught by Google and you will manage to increase your blog traffic as well as you’ll get maximum exposure also. Blogger outreach is also one of the best ways to increase blog popularity. It is actually the necessity to remain in the field and for getting maximum exposure. Many blogger do outreach campaigns just to increase links but you should not do this. You should do this campaign just to build the relationship. Once you’ll get success in building good relationship with your fellow bloggers, links and all will come automatically. Here relationship basically means, creating a channel and connection with other bloggers. You may think your primary goal is to get links and shares but not. Your primary goal should be to tell them that YOU ARE HERE. If you’ll manage to tell this, believe me you are going to get lots of exposure and hence hundreds or even thousands of traffic to your blog. What you’ve to do is email few bloggers from your niche and appreciate their work and let them know how great content they have written and ask for the advice for the improvement of your blog. Believe me first they will visit your blog and will read your articles. Later you’ll find a reply with the appreciation about your blog posts. The second thing that you’ve to do is to email them again with the link of few of your best article and ask for the share on social sites. Never ask for the links. If they’ll like your article, they’ll never mind to share or at least tweet you. Just think if you’re sending only 5 emails a day and getting only 2 shares, how much exposure and traffic you’ll manage to get. Most importantly all the visitors will be your targeted users and so chance of converting them into subscribers will be far more. I believe you’re already doing these campaigns. If not, please start doing this and you’ll see the outcome very soon. These were the best top 3 ways to increase the blog’s exposure as well as traffic for your blog easily. Also by using these methods you’ll get far more traffic and promotion then the backlinks. So start trying these methods, if you’re not doing. Or if you’re already doing this, let me know your experience with these. I hope you enjoyed reading these best blog promotion strategies. If yes, please do share this on the social media. Thanks for reading. Keep visiting!! 11 comments to ''Top 3 Most Powerful Ways To Promote Your Blog"
Thanks for the wonderful study on promoting blog. Yes as you said Social Networking, Guest Posting and Email Campaigns will definitely take your blog to the crowd and it will automatically bring back traffic and promotion. The most important thing is it is cost effective. And agree with you. These days almost every day a new social networking sites are getting started, so the chances are more to get traffic. from these sites and as almost all are free so need to worry about the money too. Just you've to use them in effective manner. Hai Friend , your article is brilliyant thanks for posting it for us , and in this post you had said the best tips to promote our website , and the explaination is very nice .. Thanks for the nice words and appreciation Sheik. Promotion is the most essential part to reach out to other part of world. 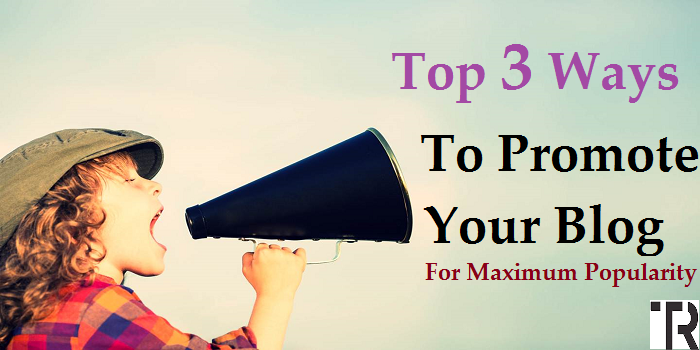 Awesome post which contain very useful information about top 3 most powerful ways to promote your blog. Very interesting and informative article. I liked it. I hope it will be helped full for every user. Thanks for sharing views. Have a great week ahead. Thanks for sharing your beautiful thoughts on this post and great to see you here. Have a great weekend and keep visiting !! Thanks Yogesh for stopping by. Hope these methods will help you. Thanks for the comment. Very good tips. Guest posting is not not considering in 2015 Google updates. They are considering not good for high quality back links. i read this type of article from expert blogs. is it true.